Two years have passed since our first abandoned dog of Pico’s dog shelter flew to Germany, to be happily re-homed thanks to Edith and Uwe of the Association Tierhilfe Phoenix. We have now started to write the 3rd page of this amazing project that gives hope to those unfortunate dogs that could not find a loving family here in the middle of the Atlantic Ocean. And it is exactly about the remoteness of our island and the difficulties we have to fly our dogs that I would like to tell you about. It is the beginning of June 2018 and Kaia, Picasso and Fred are getting ready to travel. Chip, passport, vaccines done! Crates are ready with water and food supply included. We are just waiting for the confirmation of the airline to secure their space on the cargo. 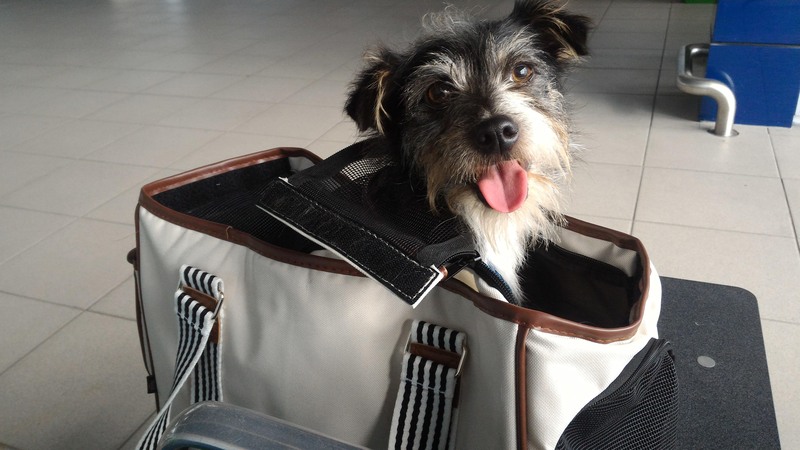 Chosen date was 9th June when our dogs would have to take 2 planes: one from Pico to Lisbon (flight operated by SATA) and one from Lisbon to Frankfurt (operated by TAP), for an overall journey of 10 hours! Here comes the answer from the cargo department of TAP: there is no space on the cargo for your dogs on the 9th June. “What about on the 12th or 16th June?” – I ask. You have to know that direct flights from Pico to Lisbon run only on Saturdays and Mondays, that is why it could not have been just the day after. Unfortunately the answer is the same: “There is no cargo space for the dogs neither on the 12th nor on the 16th June!”. Dogs could not wait any longer to reach their new families in Germany, especially Kaia was very much needed, as her future sister Bonnie was having a hard time since the end of April, when she lost her life companion Kira to a disease. The bond was so strong that Bonnie hardly ate or walked anymore. A sweet new friend like Kaia was going to heal some of her deep wounds, so that we had to get Kaia there real fast! Only one solution was possible: to fly myself with the dogs! I bought a ticket as a passenger on the desidered flight and added all the 3 dogs to my ticket! Kaia and Picasso would go in the hold, while little Fred (only 2.4 Kg) would be flying with me in the cabin. I got the overall booking confirmed, which made me discover that passengers and their luggage always have priority over the cargo transport! Fair enough, but when we talk about dogs or other animals, I believe the policy should be different. The flight was smooth, especially for Fred. Please see some pictures of us: Jess with Kaia, Fred and Picasso at Pico Airport (PIX), me and Fred in transit at Lisbon airport and further below our arrival at Frankfurt airport (FRA) where Uwe from Tiehilfe Phoenix was happy to meet us all. Previous Previous post: 1, 2, 3… 7 Picodogs adopted in Germany during Year 2017! Next Next post: The not for profit association PICO DOGS is born!